Are you looking for a fun and innovative way to teach your children about Hajj? Whether you are going to hajj or planning on going in the nearby future, Hajj is something we all should make an effort to learn more about because it is one of the pillars of Islam. Recently, we have been learning about Hajj as part of our homeschool studies, when we stumbled on a fun way to really bring Hajj to life for our kids. While some masjid weekend schools may reenact the whole Hajj rituals (which I think is awesome mashaAllah), doing so at home, may be a little too much work and preparation for the average household. That’s why we recommend giving a claymation Hajj a shot ;). Claymations or Clay animation are animations using clay figures, and because of apps like Stop Motion (and others), the process is not only accessible but also super easy for the “average non- techie Joe or Jane”. In fact, it’s so easy that kids can make their own claymations without any or very little adult supervision (yay!). What I liked best with this activity is that it really engages kids, and brings learning to life. 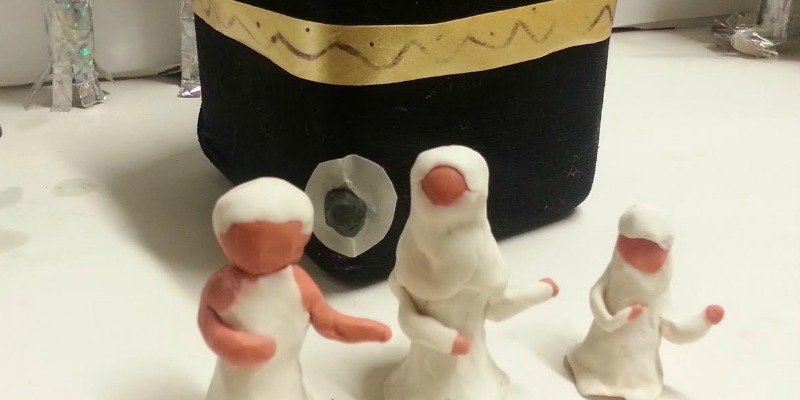 While the Hajj process can be a little complicated for a beginner to get down, having children make their own claymations helps build their interest in learning more about Hajj, as well as lock in this information in a way they will never forget. But if somehow they need a little refresher , all they will need is to press the replay button 😉 Since they have handcrafted this video, it is one they want to watch again and again, making forgetting any of the Hajj steps virtually impossible. 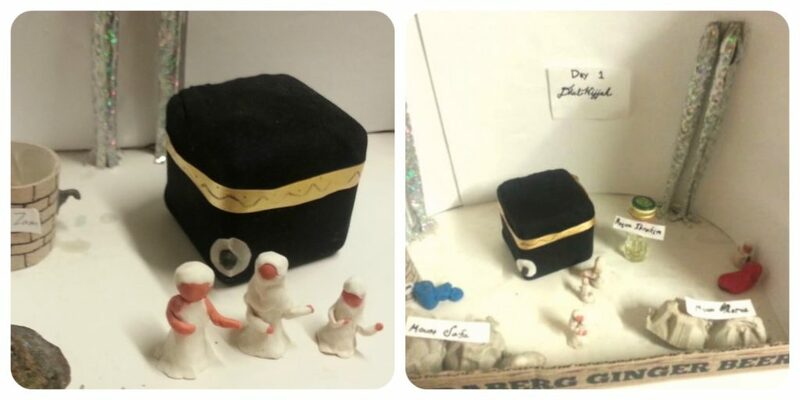 Before getting started with the actually claymation production, you should have your kids do some research about the Hajj process, as well as decide on which Hajj you want to re-enact. If you are familiar with it, you can teach your kids, or you can have them watch videos or read about it (for tons of awesome Hajj resources, you can check out this list.) Next, you will need to work on all the props for the Hajj scenes. Your children should have access to the images of the different places, so they can recreate it to the best of their ability. While Materials needed for the Claymation are minimal and most can be found around the house typically, you will most likely need to purchase some modeling clay (which is a special clay that will not dry out). When I first did this project, we got a pack with almost all of the colors of the rainbow. In retrospect, a much better purchase would have been a set with natural colors like this one, as it comes with most of the colors we really need such as black, white, and ivory. If you don’t already have one, I recommend getting a mini tripod to keep your phone camera steady for a clean shot. We found a very affordable one at Daiso that looked similar to this one. This is a scene my children created using things they found around the house. Keep in mind this is their creativity and imagination at work as no one in the family has been to Hajj or Umrah. For the Kaaba, my kids took a cube we had and placed a black nylon sock over it and wrapped a golden ribbon around the top. You can also get a milk carton and trim it into a cube, and put the nylon sock over that. For the black stone, they cut out a white circle and secured it to the corner using a hijab pin (ball headed pin). Then, they placed a piece of black clay around the ball tip of the pin. Although you won’t be drinking from the Zamzam well per se, my kids made a well out of a cut up toilet paper roll to “symbolize” the drinking of zamzam water. Mount Safa and Marwa, can be easily recreated using stones, or eggshell cartons, while a picture of a pair of scissors can signify the barber area. We used a glass bottle of golden colored perfume to symbolize Maqam Ibrahim, for lack of anything better to use. The minarets was created by rolling a shiny paper. Here is the first scene that they created depicting the tawaf portion of Umrah (of Hajj Tamattu). We are still learning and working on the Hajj part of the project, but for now I am very impressed by their work and memorization of the Talbiya mashaa allaah. Which ‘hard’ topic would you teach your child using claymations?